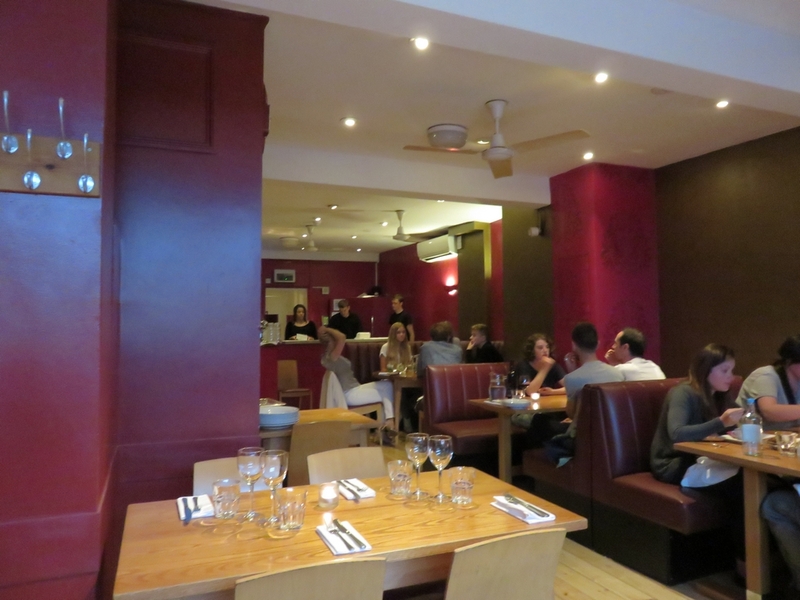 Restaurant review #49 – A couple of weeks ago, we spent some days in and around Brighton, in the southeast of England (UK). Brighton is a vibrant but also quite touristic place. I will put a more general post about our visit to Brighton up later. And there are several restaurant reviews coming up, as we defintely ate a lot! 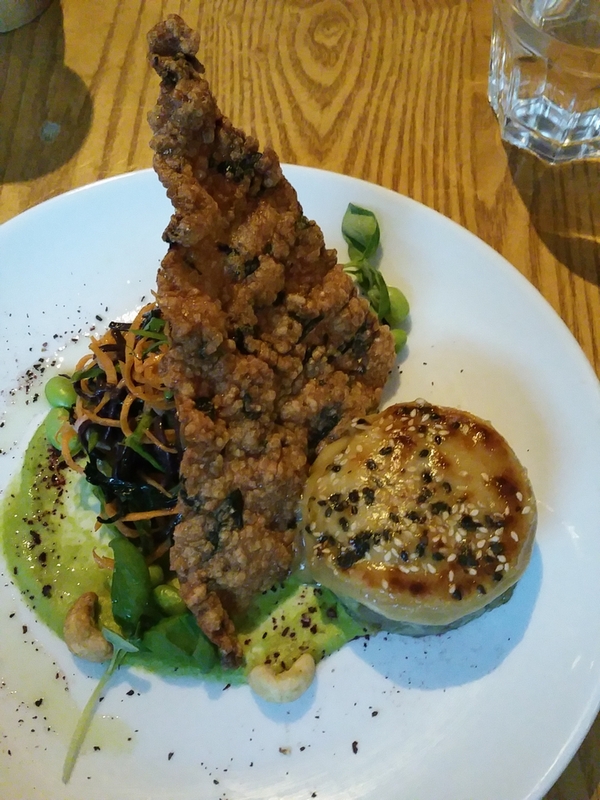 Brighton is known to be a hub for vegans, with several vegan and vegan friendly restaurants. That is also the main reason why we choose to go there this Summer! 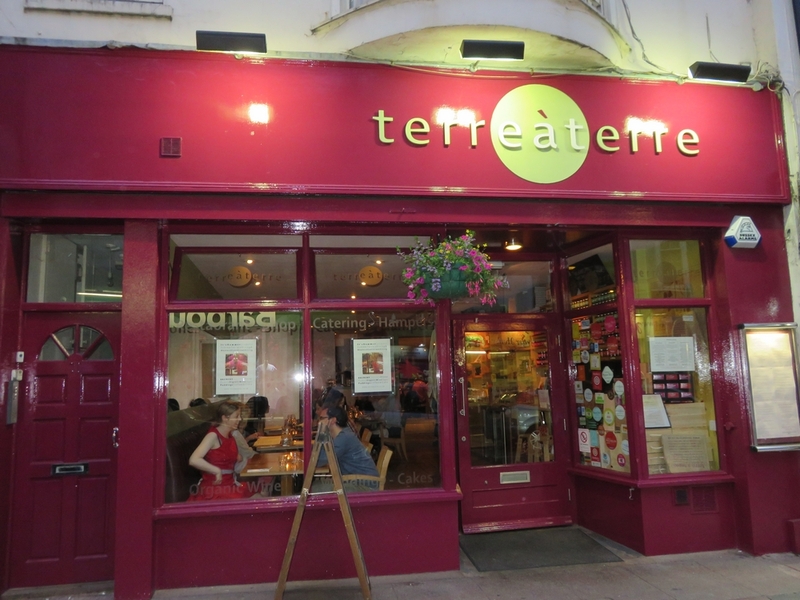 Terre à Terre is a more upstyle restaurant in Brighton. It is a vegetarian restaurant, with lots of vegan options standardly available. 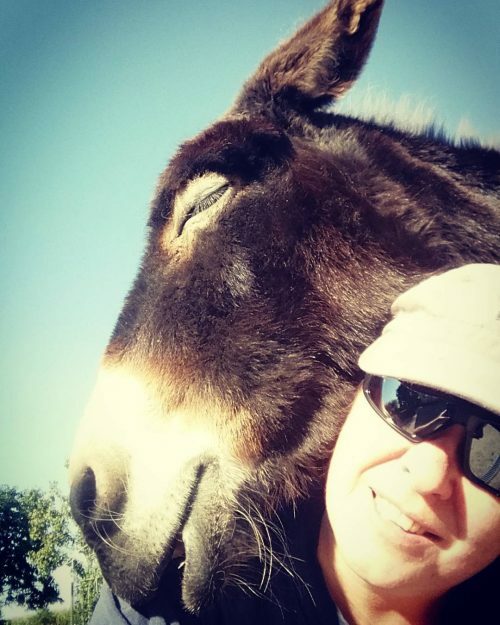 When I asked in vegan groups about definitely must places to visit, Terre à Terre was mentioned several times, so we really didn’t want to miss this! Hence, I already made the reservation (online) about a week beforehand, which is defenitely a must, since options for that Saturday evening were already getting limited. It is located in the city center, not far from the famous Brighton pier. The restaurant does not look very big from the outside, but there are many seating places in the back of the restaurant, and also a small outdoor terrace at the back. We were quickly seated and got a jar of iced tap water for free. This might not seem special for some people, but we really appreciate it as it is such a rare thing in Belgian restaurants (they never serve tap water!). 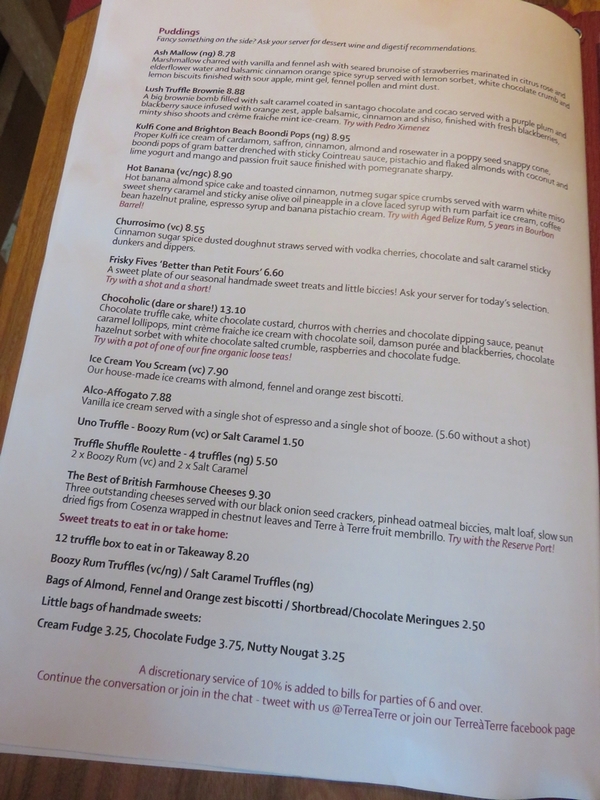 We needed some time to dig through the extensive menu, as we are also not used to having so many options to choose from. 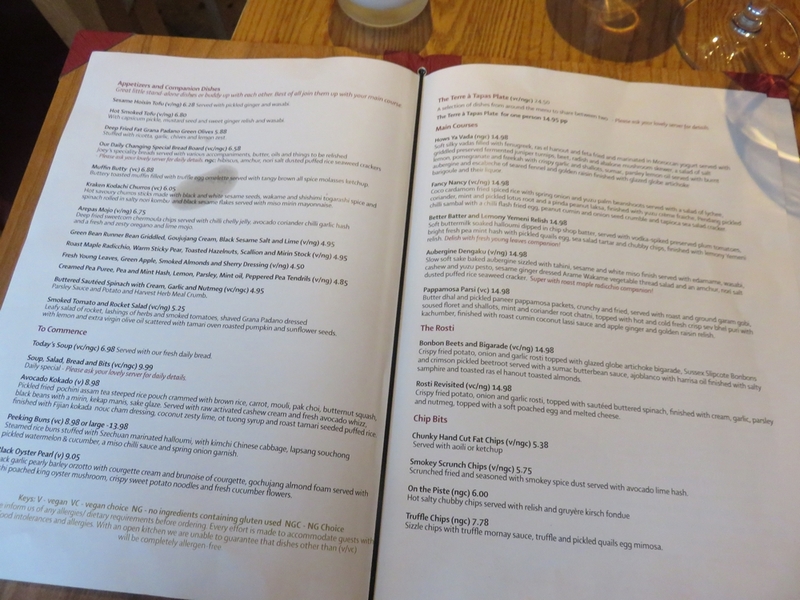 Vegan options are clearly marked and the wine list also clearly indicates the vegan options. After ordering, we were in for a loooong wait (and the restaurant wasn’t even full yet at that time). After about 45 minutes, one of the managers came and give us a bread platter with some dips, and apologised for the long wait. Upon checking whether all the dips were vegan, he apologised again, and took one of the bowls away (always better to check and double check, even after having ordered everything vegan!). 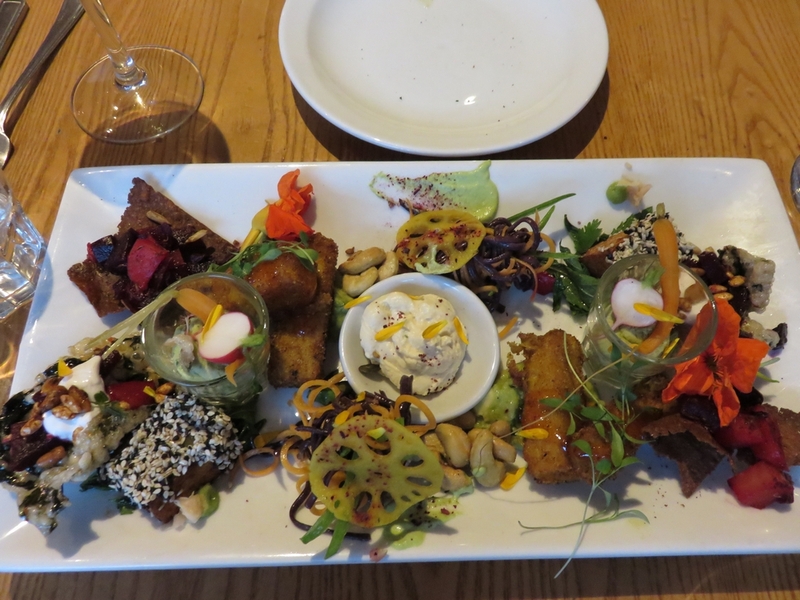 As a starter, we ordered the vegan tapas platter (must be ordered by two), which is £24,50. 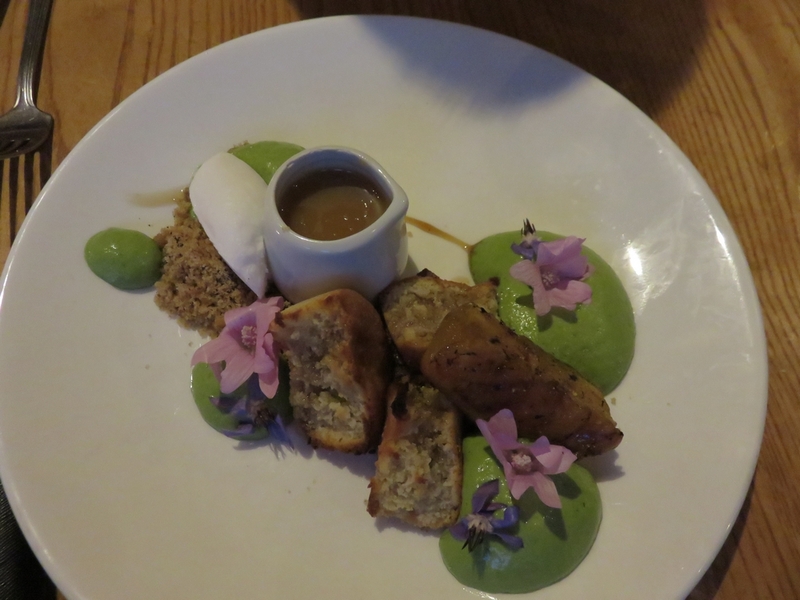 This was one of the most beautifully presented plates we have ever had on restaurant! 🙂 Not only very nicely presented, but also delicious and so much variety! I cannot even begin to describe what was on it, there were so many different things! Incredibly good! 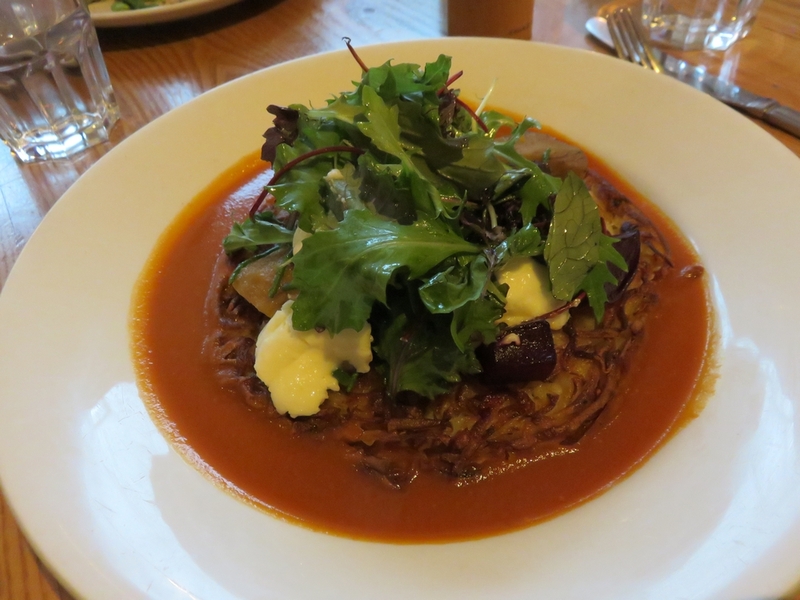 As main courses, we ordered the Rosti bonbon beets and bigarade and the Aubergine Dengaku (each £14,98). See the photo of the menu below for a full description of these dishes. The main courses were also delicious and nicely presented! By that time we were quite stuffed! But as everything had already been so delicious, we really wanted to try a dessert. So we ordered the hot banana almond spice cake. Again, it was very enjoyable! This was undoubtedly one of the best restaurant experiences we ever had. Simply delicious, great variety and nicely presented. It comes with a price though. £12 for a starter (which is roughly 18€) is quite expensive. And contrary to prices in Belgian restaurants, service is NOT included (so you are supposed to leave a tip of roughly 10%). But we thought it was well worth it. The only downside was the long wait before we were served, and when the restaurant filled up, it was rather ‘noisy’ and busy (although I think table spacing is good, not seated too close to each other, at least not where we were in the back). Another thing we have noticed is that none of the restaurants we visited in the UK use table cloths (as opposed to in Belgium, where this is more common, even in bistro style restos). Not that we think this is a must 😉 but it would give the interior a bit more of a ‘restaurant’ feel. 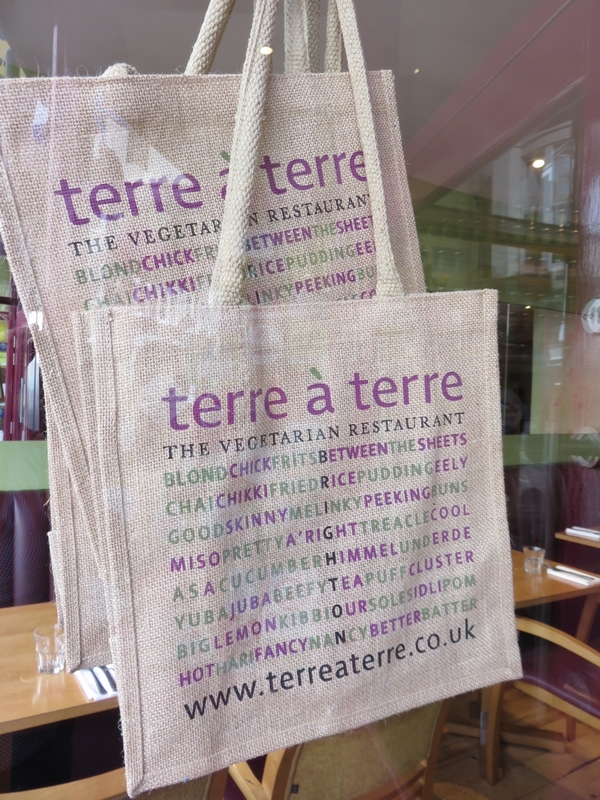 We loved it, and if we ever come to Brighton again, we will surely visit Terre à Terre again! Your main course and for sure the others too look nearly like a little fantasy world:D Does that sound weird? Love it though! it was indeed a wonderful experience. Thanks for your comment Anna! Terre a Terre is the best! 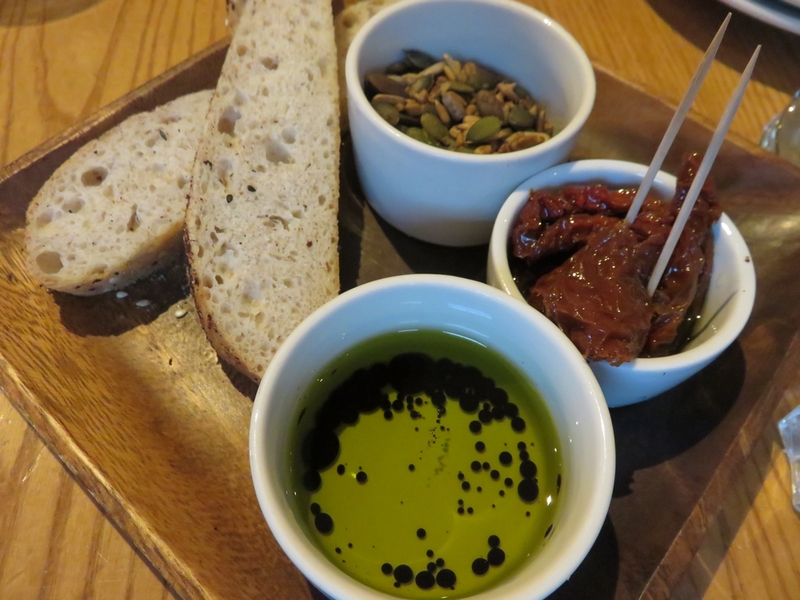 The sharing platter for starters is so good, I’ve had it twice and enjoyed everything both times. I’m glad you got some free tap water – I remember you commented before when I was grumbling about the lack of tap water in Ghent! Terre a Terre is indeed the best! of all the places we went to in Brighton, this was def. the best culinary experience! Wow that looks amazing, especially the Tapas platter! The tapas plate was one of the most beautiful dishes we have ever had on restaurant!